With Customer Experience (CX) being a dominant area of importance, focus and competitive differentiation for companies, it’s no wonder that marketing organizations are already shifting towards becoming customer-centric. 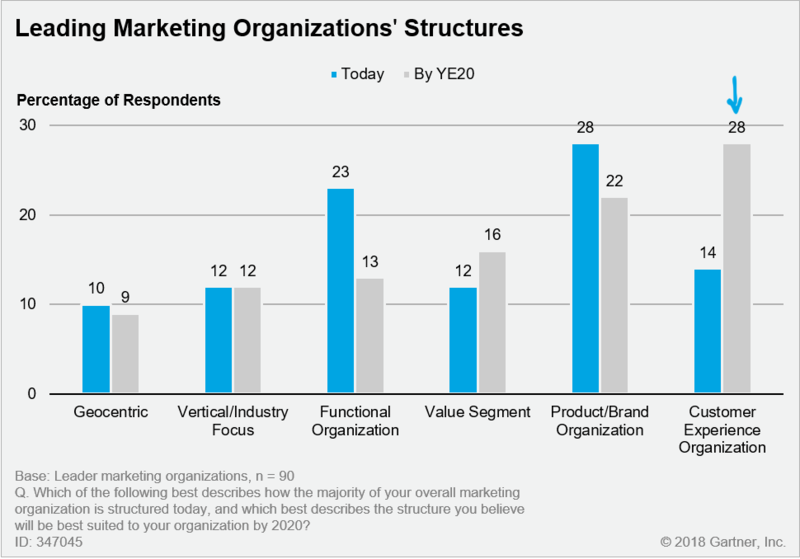 Gartner’s “Survey Analysis: Know the Organizational Traits of Leading Marketing Teams” (Gartner subscription required) shows that, by 2020, the most common organizational structure for leading marketing teams — those with greater responsibilities such as owning P&L responsibility — will focus on customer experience. Being customer-centric, or having a culture of “customer-first” does not mean “customer-only”. It is not at the exclusion of the goals your company or organization wants or needs to achieve. Instead, being customer-centric is the means by which your company will achieve its goals. We are all responsible for acquiring customers, growing our relationships and driving loyalty and advocacy. Customer experience is a main driver in achieving that acquisition, growth and retention. The playing field has changed and our prospects and customers have more choice, access and power than ever before. If we, as brands, don’t provide them with the solutions, services and experiences they need to accomplish their goals, they can easily abandon us for those who do. We need only to look at leading organizations such as Starbucks, USAA, Ritz Carlton, Amazon and Zappos to see how putting the customer first aligns with and impels organizational success and why it’s well worth the effort. WATCH FOR IT: To further expound upon the topic of being customer-centric, on Monday, April 23rd, my fellow CX analyst, Augie Ray, will publish a compilation of articles and Gartner research notes (subscription required) that offer more insight into and examples of how organizations have implemented, are living by and achieve success through the adoption a customer-first mindset. Be sure to check back for them! The shift from a product-focused culture in the B2B tech space (my domain) is a significant challenge. We have lots of people who say they want to change, but then every go-to-market narrative discussion tends to digress to a topic that’s more about the speeds and feeds of the underlying technology. Questions about how this perspective might be related to customer needs and wants for business outcomes tend to go unanswered. Inside-out thinking is especially pervasive at companies where employees have worked there for decades. Removing deep-rooted cultural limitations is a daunting task. Hi David, thanks for such a great comment! You are absolutely correct, and it’s not just a significant challenge in B2B tech space. It’s a challenge for most organizations regardless of size, industry, etc. Companies, and their leadership, are still too heavily focused on short term gains only and thus keep their internal processes, systems and decisions organizationally-aligned. The ramifications of this are already occurring as we see once strong brands and verticals collapse or fall prey to disruptors. Abraham Lincoln said “You cannot escape the responsibility of tomorrow by evading it today” and, while I am hopeful more companies and leaders will recognize, and truly drive, the need to switch to an outside-in perspective, unfortunately I think brand hubris will stand in the way and many organizations will realize it too late. You are welcome! I am glad it was of value for you.